Bluff Cottage - July weeks available Saturday to Saturday! Vacation rental 10 minutes from Burlington on Mills Point. 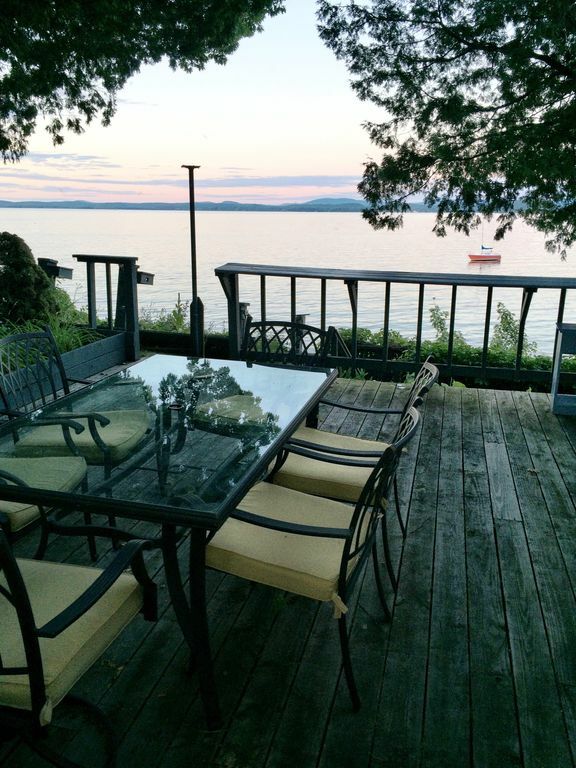 Cottage has been lovingly maintain and has an oversized deck that looks out over the lake. 2-3 minute walk to the private community beach for swimming, paddling or kayaking. Minutes from the Colchester causeway, so bring your bikes or use the cottage bikes and go enjoy the sunset! Beautiful views of the sunrise from the deck or living/dining room. Enjoy views of Camels Hump and Mt. Mansfield in the distance. Cottage is fully furnished including a gas grill and everything you'll need for a week at the lake. Owner is minutes away and can help you with anything you need. I grew up spending summers on neighboring Colchester Point and love being on the lake, biking, walking, paddling and kayaking. This is a unique and very private property where you can relax and leave all your worries behind! I can be flexible during the non summer free to ask! Beautiful view, minutes from Causweay, close to Burlington, great for swimming and boating. Cottage has several bikes that are available for guests to use. Gorgeous views looking out towards Porters Point and Malletts Bay. To the left you can see Milton and the causeway into the islands. In the distance, you can see Camels Hump and Mount Mansfield. The property sits on a bluff and has 100 feet of private lakefront. Tennis courts at Airport Park 1 mile away. We happened to pick a week when it would be on the cold side (30's and 40's) with intermittent rain. But the cottage still worked out great for us. The best part of Bluff Cottage is the front room facing the lake. We spent most of our time in that room. We could watch the moods of the lake while being inside, away from the elements. The rest of the cottage is nice..."cabiny" feel, some rustic elements but decently decorated and has what you need for today's living. The location is pretty great! Very close to the causeway (we walked it twice...you see so much more that way...and my husband biked it several times) and the bike route into Burlington. It's in a quiet neighborhood, at least at this time of the year, with some restaurants and stores a few minutes away. The drive to Burlington wasn't bad and that had all kinds of restaurants and shopping choices. Karen was easy to work with and was a very conscientious hostess, texting us to make sure everything was going all right. We were quite happy with this Homeaway choice! My wife and wanted a pleasant place to stay on the water for an October getaway to Vermont. This canp was perfect! Cozy, comfy, with beautiful views. We took walks around the point and up along the bke causeway. In summer, it’s probably a grand place for a swim and to go kayaking. The kitchen is all set up with accoutrements and the bathroom with towels. We were plenty warm when the cold winds blew and fell asleep to the gentle sound of rain. Lots of good information provided on local attractions. We hope to come back and visit Bluff Cottage again—as a quiet place to relax, it can’t be beat! Was a wonderful place to enjoy the beauty of Vermont. Close to hiking and biking trails and the wildlife around the area. Owner and her helper were very friendly and helpful. We had a few TV and heater problems but overall it was a good experience. Our family fell in love with this cottage! The view from this property is absolutely gorgeous! We all rose early to watch the sunrise, comfortably sitting in the front room, captivated by the beauty of Mallets Bay. The neighbors are friendly and welcoming. We brought our bikes and really enjoyed the causeway, it's spectacular. The picturesque ride into Burlington on the bike path was also noteworthy and only about a half hour of pedaling. It was difficult to leave, we really enjoyed staying at Bluff Cottage. Sweet Cottage - even if a little small ! We stayed at Bluff Cottage the 2nd weekend in May, it was so sweet. I do want to say that the cottage is a 2 bedroom, the listing states it is a 3 bedroom. It made for close quarters with 6 adults. It was chilly when we arrived and Karen was kind and brought us an electric heater and it really helped take the chill off. We loved the big deck and amazing view. We enjoyed our stay .